After almost three weeks denying that anything unexpected had happened in its diplomatic premises in Turkey, Saudi Arabia admitted that Khashoggi had died, but claimed it was the accidental result of a brawl. Turkish officials privately believe that he has been dismembered and Saudi authorities have failed to produce his body or say where they believe it is. They only admitted that the officials had done a cover-up. 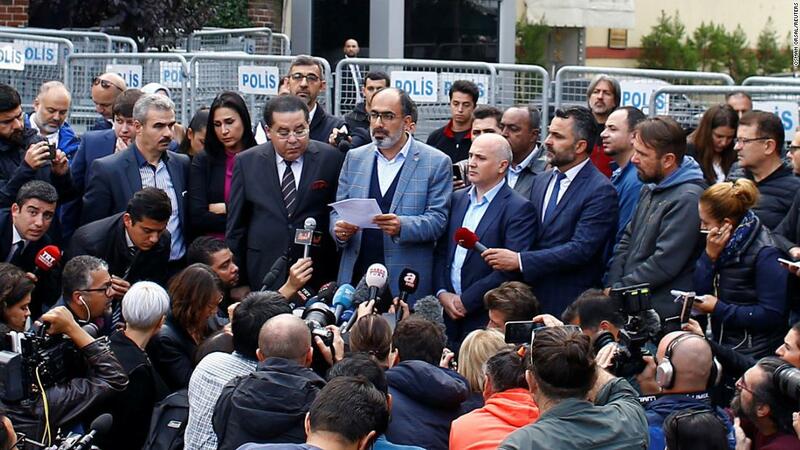 On Saturday in front of the Saudi consulate in Istanbul, Turan Kislakci, head of the Arab Media Association and friend of Khashoggi, spoke to Saudi Arabia about the journalist's body. "Give us Jamal so we can have a funeral for him, so that all the people who care about him, the leaders of the world, can come to Istanbul for the funeral," Kislakci said. 8 days ago, a brutal one Like Saad Hariri, we thought that (Khashoggi) would go out, and three days later we lost hope," he said, referring to the case of Lebanese Prime Minister Saad Hariri, who after several Sources in Saudi Arabia. last November. Eighteen (suspects) are not enough. We want those who have ordered it. " Justice and The Development Party spokesman, Omer Celik, pointed out that Turkey was not affiliated with the Satisfied with Saudi claims that Khashoggi had died accidentally and not due to premeditated killing. "We do not blame anyone, but we also do not allow cover-ups," Celik said on Saturday, in the first official Turkish response to Saudi Arabia's midnight statement claiming Khashoggi's death was a coincidence. "It's a matter of honor for us to discover this. We will illuminate this by all means. This is the will of our president, "Celik said. In a statement released early in the morning Saturday morning, Saudi Arabia claimed that Khashoggi died in a fistfight after a discussion turned violent The Saudi Royal Palace told CNN that Khashoggi's cause of death was a stranglehold or strangulation in the resolution of the Saudis, but officials did not provide any evidence to back up the conclusion. According to the statement, several Saudi officials participated in the country's consulate Istanbul Turkish officials say 15 Saudis had traveled to Istanbul from Khashoggi on the day of the disappearance, and they said privately that he had been dismembered at the consulate. The authorities announced a purge of the highest Saudi n officials, the detention of 18 people and a major overhaul of intelligence services, led by the country's de facto ruler, Crown Prince Mohammed bin Salman, aware of the operation to target Khashoggi. Riyadh's statement was the first official confirmation that Khashoggi died in his Istanbul consulate, and the first admission that it played a role in his murder – even though it claims death was accidental. US President Donald Trump said he believes the Saudi account is credible But he added that there are still some questions to ask, and UN Secretary-General Antonio Guterres is "deeply disturbed by the statement," said his spokesman. Some members of the US Congress did not accept the Saudi version of events so much. " Being skeptical of the new Saudi story about Mr. Khashoggi is an understatement, "said Senator Lindsey Graham of South Carolina on Twitter. Khashoggi joined in June 2017 Implied exile Bin Salman was elevated to crown prince. In his first Washington Post article after leaving Saudi Arabia, he described the political atmosphere in the kingdom as "unbearable." His assassination at the Consulate is in the midst of a wave of arrests targeting clerics, human rights activists and members of Saudi Arabia's intelligence. The crackdown was largely led by a powerful security apparatus known as the State Security Presidency, created and led by Bin Salman.